Happy Halloween! I guess. I am not a big Halloween person. Costumes are not my thing, and I don't enjoy the pressure of (mostly self inflicted) of having a good costume. I always feel like people expect you to have put a lot of thought and energy into your Halloween wardrobe so you can be something funny, or clever, or pop-culture-relevant. The last of which is hard for me, because I don't watch any cool TV or keep up with current movies. I am more of a "I will wait for it to come to On-Demand" type of gal. The worst was in grammar school when you were forced to parade around the school yard in front of everyone in your stupid costume. It used to give me so much anxiety. I would think to myself, "What's worse? Having a stupid costume that you feel uncomfortable in and think everyone is judging you for? Or being the only kid in the parade still in your school uniform because you succumbed to the pressure of Halloween?" I always ended up in a costume. Ballerina three years in a row. A well-intentioned Bride of Frankenstein idea gone completely wrong. A clown with a bowl cut and melting face makeup that made me look more like "The Scream." Just to ice the anxiety cake that was Halloween for me, I was also terrified of scary costumes, haunted houses, and the dark in general. I had a couple of night terrors as a kid and Halloween for me was like being stuck in one for 24 hours... and if my friends were really into Halloween, more like a full week of haunts and crying. To give you an example, an older neighbor kid one time dressed as a werewolf and had what I can only imagine was a pretty good mask. I screamed, balled my eyes out, and ruined his trick-or-treating because he couldn't wear the mask around me. I am a joy to be around, in general, but especially around Halloween. Instead of trying to pretend this day is fun for me, I am just going to focus on the good parts of fall and this holiday! Pumpkin! Candy! Sweaters! Candy! Today's recipe is a SUPER simple recipe. The grocery store did a lot of the heavy lifting for me and I basically just assembled. A little childhood treat, made a little grown up with some more mature flavors, but nothing a kid still wouldn't dig their teeth into. 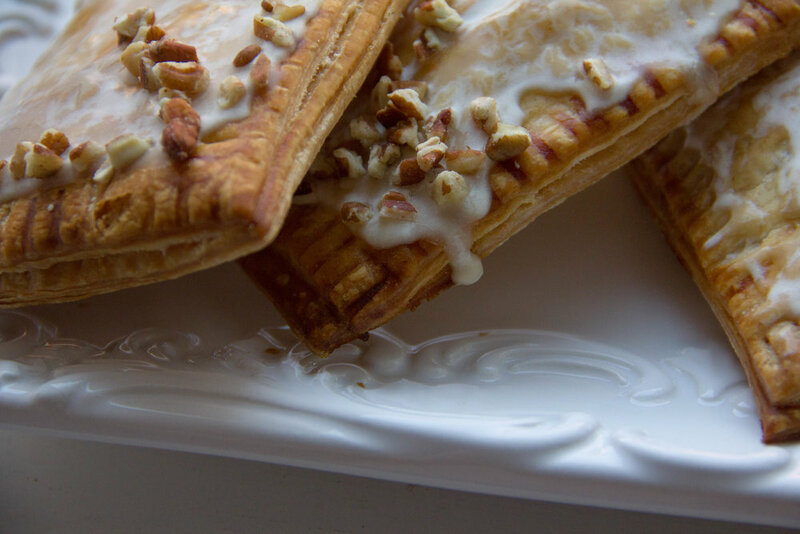 Pumpkin Pecan Pie Pop Tarts. Say that five times fast. I use store bought pie crust (make your own if you feel like it, I didn't this time), store bought pumpkin butter, some chopped pecans, and a little maple syrup glaze. Preheat oven to 400*F. Line a baking sheet with parchment paper or a silicone baking mat. Make your egg wash by beating together one whole egg and 1 tbsp of water or milk. Set aside. Roll out slightly the pie dough, one sheet at a time, to make slightly larger and more of a rectangle shape. Cute the edges to make a clean rectangle and then cut into 6 or 8 smaller, equal-sized rectangles (depending on how big you want each tart to be). Repeat with the second sheet of dough. Spoon 1 tbsp of the pumpkin butter onto one half of the tart, spread using the back of the spoon leaving about 1/4 inch of space around the edges. Sprinkle a few chopped pecans across the pumpkin butter. Lightly brush some of the egg wash onto the edges and lie another pie dough rectangle over the top, lining up the edges. Crimp the edges with a fork to keep them sealed. 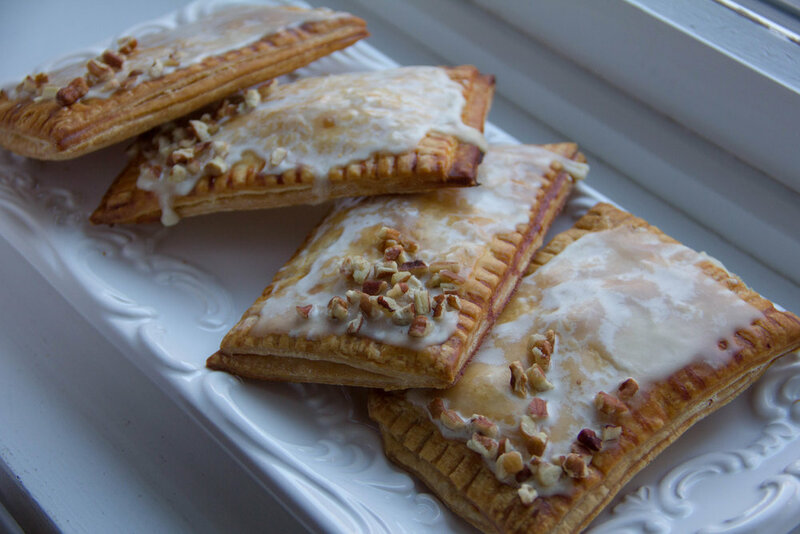 Repeat with all of the dough until you have 6-8 pop tarts, and lay flat on the baking sheet evenly spread apart. Once assembled, place whole tray in the fridge for 10-15 minutes to allow the dough to firm back up slightly. After they have rested, brush the egg wash over the top of each and poke a couple of holes in the top with a fork to allow steam to escape. Bake for 20-25 minutes, until the tops and edges are a golden brown. Pull from the oven once baked and allow to rest on the sheet for about 5 minutes then transfer to a cooling rack to finish cooling. While those are cooling, mix up your glaze by whisking together the maple syrup and the powdered sugar. 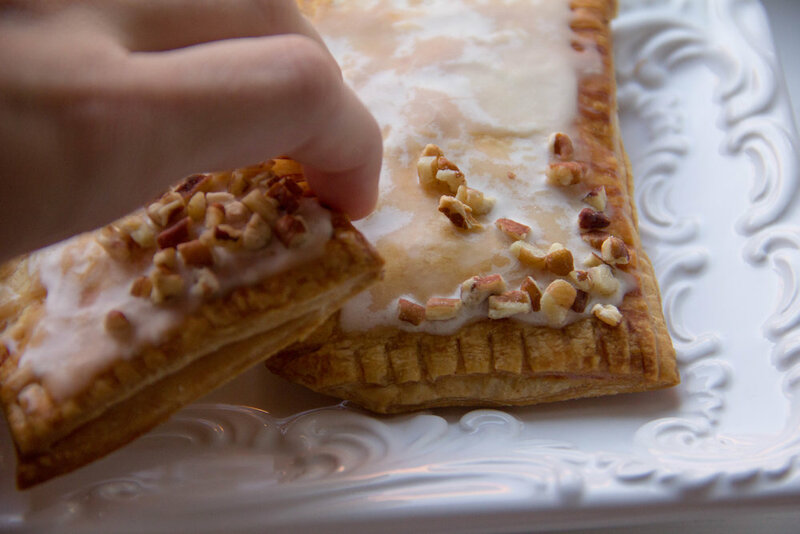 Pour a little of the glaze onto each tart and spread quickly to the edges. Sprinkle with a few more chopped pecans and then they are ready to eat!